The name of this stone dates back to the 16th century. It comes from the French "pierre turque" or "Turkish stone" because it really became famous in Europe during the Crusades. 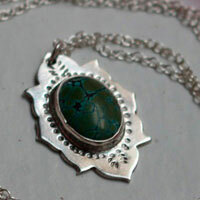 Turquoise is rare and precious for its quality. 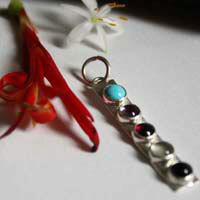 It was appreciated as a precious and ornamental stone for centuries because of its beautiful color. Nowadays, it is so popular on the market that there are many fake ones, which are difficult to identify, even by experts. 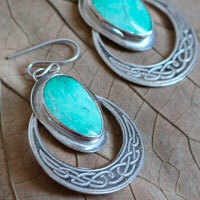 Turquoise is an opaque mineral type composed of hydrated copper phosphate and aluminum that gives this blue color. 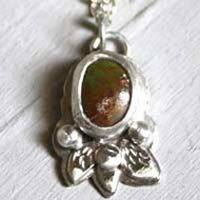 The green color that one can often see is the result of iron impurities that replace aluminum. Because the mines are not producing enough, many imitations can be found on the market. 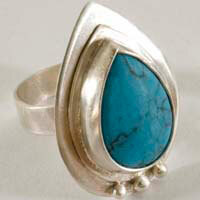 We know how to imitate turquoise since the Egyptian period through the process of earthenware. Currently, porcelain or plastic techniques are used (pressed, glued and dyed)… you can also find the Vienna turquoise which is the compression of aluminum phosphate, or the Neolithic turquoise that is a mix of bayerite and of copper phosphate. These products are quite easy to identify physically or chemically. But in 1972, Pierre Gilson presented a real synthetic turquoise that you could only recognize by its chemical composition. 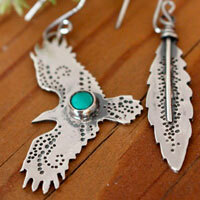 It presented the colors and the veins of the natural Nevada turquoise. 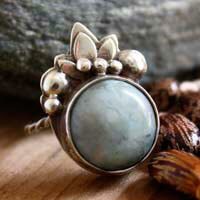 The most common imitation is the use of the howlite stone that is very similar physically. It is then dyed. Other minerals are used such as chalcedony, jasper, marble, variscite, faustite but are not so close to the real stone. 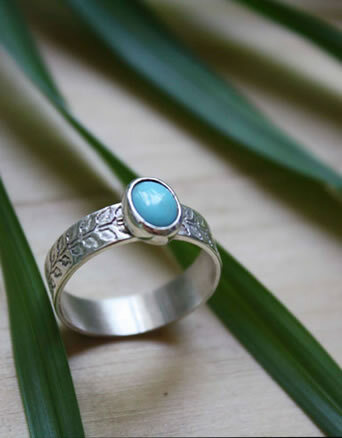 Turquoise was appreciated a lot by the antique cultures: it was used by Egyptian governors, Aztecs and other pre-Columbian cultures, Persians, Mesopotamians, Indians and Chinese. 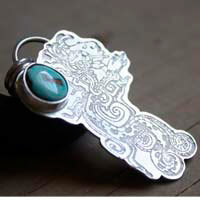 Turquoise has been excavated in Iran for more than 2 000 years. At that time, Iran was known as Persia. And in this country, they would call turquoise "Pirouzeh" meaning Victory. Then it was called "Firouzeh" after the Arabian conquest. The deposit is blue and can become green once heated. In the Persian Empire, it was thought that wearing a turquoise around the neck or as a bracelet would protect people against natural death. People also thought that when the color would change, a great misfortune was going to happen. In Iranian palaces, cupolas are often decorated with turquoise symbolizing the sky on earth. Since at least the first dynasty of pharaohs, Egyptians have been used to excavate mines of the Sinai Peninsula. 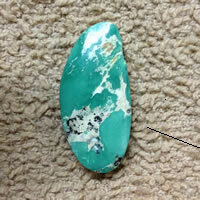 This turquoise comes in green colors. It can be found on several objects that nobles owned. The most famous example is probably the mask of Tutankhamen. 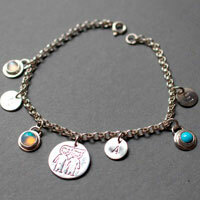 Turquoise was associated to Hathor, the goddess of love, beauty, music, motherhood and joy. These stones would arrive in Europe through Turkey. This stone was important for Turkish knights who thought that it would protect their horses from falling. The Roman Pline the Old would call it Callais. Turquoise would be one of the stones of Aaron’s cloth as described in the Bible (Exodus 28) according to the different interpretations. 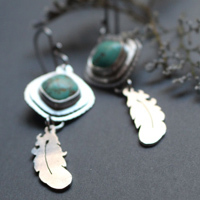 In the USA, it is thought that the making of jewels (such as amulets) with turquoise was the main activity and a mean of development for Pueblos Indians (more particularly of the Anasazi). Recognized activities of other tribes such as the Navajos would only date back to 1880 because of the European influence. 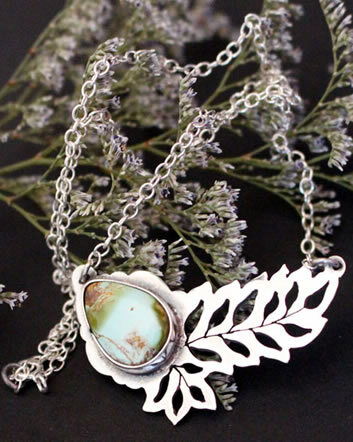 Apaches and Navajos would associate the stone to Estsanatlehi, the goddess of change or "Turquoise woman". She was the goddesss of the seasons. Apaches would consider that if a turquoise were attached to the bow or the rifle of a warrior or a hunter, this latest would not miss his target. For Sioux Lakotas Indians, it was associated to Whope, the goddess of peace. Apparently, it was unknown in Indian until the Moghol period and in Japan until the 18th century. In Europe, turquoise became fashionable and was very present in the 1800s because of the archeological excavations in Egypt and more especially with the discovery of Tutankhamen’s grave. 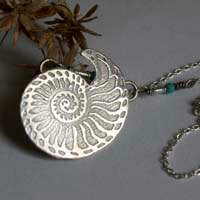 Therefore, a neo-Egyptian style appeared in architecture, jewelry and other objects. Mines: Tanzania, the USA, Iran, Israel, Turkey, Mexico and China. Turquoise would help with eye problems. It would relieve the nasal tract and mucous membranes. It would stimulate the heart and the throat. 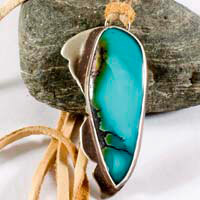 Turquoise would unblock problems of circulation in the body and would help with inflammation. It would eliminate toxins in the body, the gout and acidity in the body. 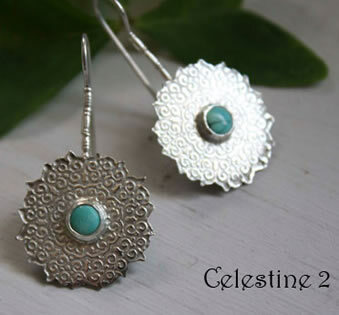 Turquoise would relieve muscle pains and rheumatism. It would stimulate the pituitary and would help preventing headaches. 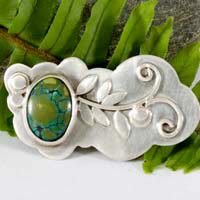 Turquoise would help protecting the spine from arthritis and the lungs from asthma.